OMGosh y’all, spring is almost here!! I’ve already used my garden planner to decide what I’m going to plant and where in the garden this year, and I’ve planted up my indoor greenhouse so I’ll have heirloom seedlings to drop in the ground around Easter (we’re in planting zone 8 here in NE Texas). All of this is standard, I do it every year. But one thing that’s NEW for me is how I’ve planted these heirloom seeds. I typically plant my seedlings in plastic yogurt cups saved for me by a family member but this year I’m also experimenting with planting in cardboard tubes. I’ve read when it’s time to put your precious seedlings into the garden that the whole shootin’ match – cardboard tube & all – can be placed in the soil! The cardboard will simply decompose and enrich the soil. I like that! But I knew I’d be giving this new seed-planting medium a try this year so I’ve been saving my toilet paper rolls for a while. Now it’s finally time to put them all to good use. I bring out my saved rolls and flattened them out. Then I cut into the bottom about 3/4 inch. Then I flattened the tube the other way and cut another 3/4 inch on the opposite side, resulting in four slits cut in the bottom of each tube spaced approximately evenly. While they were flattened out I took a permanent marker and wrote on each tube what kind of seed I would plant in them. Instant plant markers! LOL Then I just went around and folded each section down and tucked the last section underneath the first, making a closed bottom. EASY! Now I take my seed-starting mix and fill my new planting tube about 3/4 of the way, pressing firmly to pack it in well. Now all that’s left to do is to add a seed and top with soil. But I figured once I watered these tubes they might start to unravel with the moisture so I packed my planted tubes into various containers such as the bottom cut from a juice bottle, an old metal loaf pan and the like. I gave all my newly-planted seeds a quick drink and placed the containers inside my Indoor Greenhouse so they’d have the moist environment they love to sprout quickly. I’m already seeing many heirloom veggie seeds sprouting! Now when it’s finally time to plant my seedlings outside I’ll be able to drop the heirloom seedling – tube and all – into the soil. LOVE IT! This entry was posted in Blog Posts and tagged Environment, Frugality, Gardening, Make-It-Yourself on March 13, 2016 by Texas Homesteader. I’m glad you’re using toilet paper rolls this year. I think you will love them! We’ve been doing that for about 7 years now, and I’ve always had the best luck with them! I’ve got my garden planned, my seeds and soil ready, and several hundred ‘seed pots’ built and ready to go. That’s on my to-do list for the weekend. I will be using YOUR idea of clear totes for the first time! Do you ever stack them, in front of a sunny window? Our guest bedroom faces south and has a big sunny window. What a great idea!! I love anytime we can up cycle something!! !Thanks for sharing on My 2 Favorite Things on Thursday!! Hope to see you tomorrow!! Pinned! I’m making my seed starters form different materials already and these cardboard tubes are a good idea too. I’m usually using old newspapers or egg cartons and often forget how easy and fast is to turn these tubes into starters. Thank you for sharing this great info and happy gardening! I love learning of new ways to start seeds. I really like this idea. So inexpensive and you get to reuse what you already have. Great idea! Of all the seed-starting ideas, I really like this one. Can’t wait to try it! Keep us updated. That is such a cool idea! I love how you can put the whole tube into the ground! Much better than yogurt containers! We have done this too and I love that you can place the WHOLE tube into the soil!!! No need to accidentally dismember the plant when you are transplanting it! 🙂 As always, thank you for sharing at the Art of Home-Making Mondays! I love your ideas! I’m looking forward to your updates on the cardboard tubes. Holy cats- using stale ice cream cones is genius! 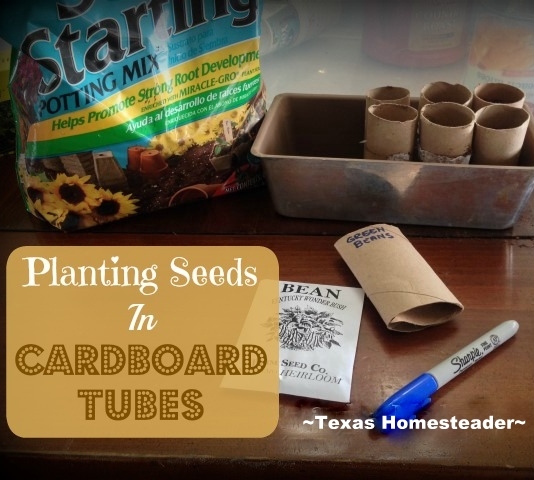 Cardboard tubes work Great for seed planting. Can also use newspaper if folded just right. I have used those rotisserie chicken containers as a mini greenhouse and believe it or not ice cream cones (the round bottom ones, not the sugar cones) Using the ice cream cones started when I had part of a box that went stale so instead of throwing them out, I saved them till it was seed starting time and planted my little seeds in them cones.